AceText is a companion that eases and speeds up your everyday computer activities, whether that is writing reports or documents, text editing, programming, collecting information, conducting research, sending and responding to email, messaging and chatting, or any or all of those. In all these activities you are working with text. 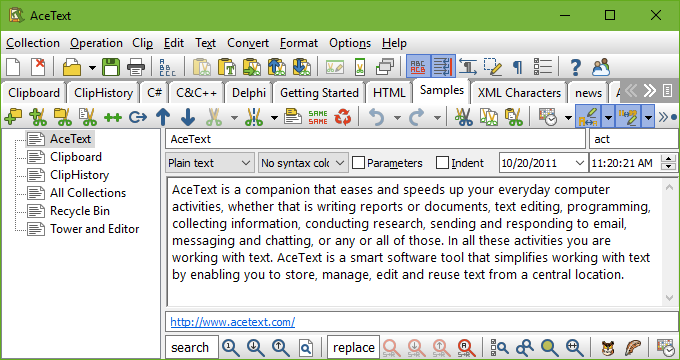 AceText is a smart software tool that simplifies working with text by enabling you to store, manage, edit and reuse text from a central location. AceText extends the Windows clipboard, enabling you to copy and paste like never before. Take notes, jot down ideas and keep important information at your fingertips. Use templates to quickly communicate via email or instant messaging. Never again type in the same message twice. Store and move around blocks of text to easily edit complex documents. Drag and drop text from web sites and compile research. Instantly find previously saved snippets throughout all your AceText collections.